Polybead® Carboxylate Red Dyed Microspheres 3.00μm | Polysciences, Inc.
Polysciences is the leading supplier of dyed microspheres to the latex agglutination and membrane-enhanced immunoassay marketplace. Diagnostic manufacturers rely on our precisely controlled particle synthesis to ensure reproducibility in both assay design and performance. 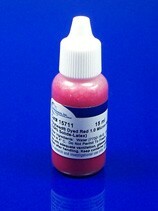 Our dyed Polybeads® are packaged in an economical 2.5% aqueous suspension. 3.00µm particles packaged as 2.5% aqueous suspension.